I find myself perseverating over the awful macroeconomic policy record of the Conservative-Liberal Democrat government of the past five years in Britain, and the unconvincing excuses of those who claim that the austerity policies it implemented were not a disaster–and that the austerity policies it ran on would not have come close to or actually broken the back of the economy. 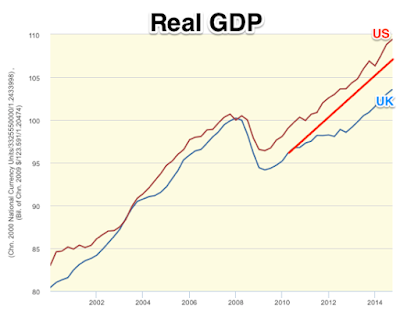 The red line is supposed to show us how real GDP would have behaved in the UK if it wasn't for austerity. It must feel good to be so self-assured in one's diagnosis of an ailment. But Dr. Brad, forgive me, I do have some questions to ask of you. Which is fair enough, I think (I offer my own thoughts on your post here). But then, when you want to focus on the "depression" in the U.K., in and odd about-face, you ignore their labor market performance and focus solely on GDP. Why might this be? 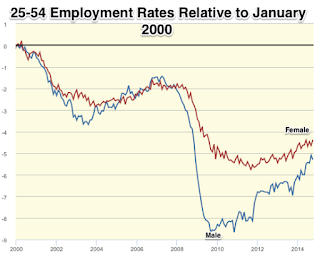 I think we should also take a look at the labor market data. If the effects of austerity are going to show up anywhere, I would think we should find them there (this is what our textbook models tell us, at least). Yeah, I'm still not seeing it. How about participation rates? Nope. Sorry. What if we focus on employment-to-population for prime-age workers? Gee, the UK is actually looking pretty good against the US here. 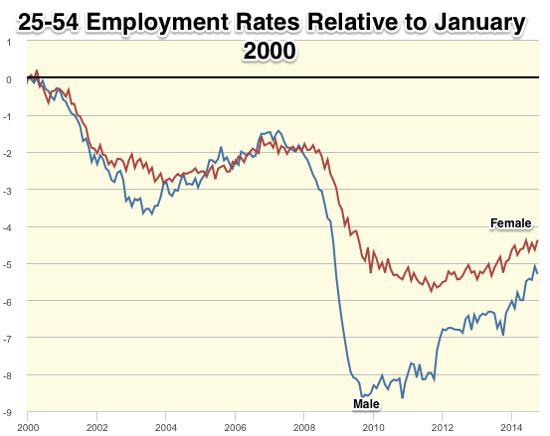 Remind me again, it was the U.S. that had the stimulus, right? How about the prime-age part rates? If anything, the UK had a higher rate of inflation over its period of austerity. Well. OK, let's go back to GDP. Ah yes, there you have it. 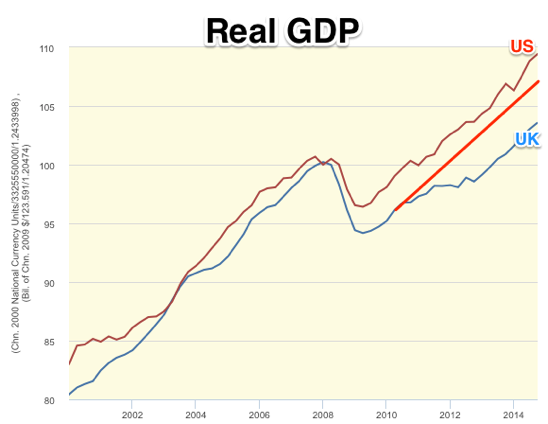 Austerity evidently killed GDP, but not the labor market. That's a very interesting hypothesis, but I'm wondering which textbook theory is consistent with it? One story that makes sense is one in which austerity is somehow influences the productivity (or measured productivity) of workers. Classic Keynesian demand-stimulus measures are not typically thought to work through their effects on labor productivity (though, they could if government spending was in the form of infrastructure, for example.) The usual prediction is that an increase in G increases employment and reduces the average product of labor, where the effect on labor productivity is incidental (expansion of labor + diminishing returns to labor). Interestingly, a neoclassical model with heterogeneous (high/low skill workers) could be consistent with these observations. 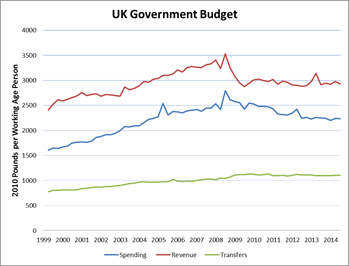 Suppose that austerity takes the form of cuts to transfers (which may not have been the case). Then a standard wealth-effect motive induces workers to increase their labor supply (lower their reservation wages when searching for work), to make up for the loss in their after-tax wealth. To the extent that this wealth-effect is stronger for lower-skilled workers, the average quality of labor (measured labor productivity) declines. This is just a classic composition effect. I'm not suggesting that this is what happened. It's just interesting to note that it is theoretically possible from a neoclassical perspective and not so obvious from a Keynesian one. Anyway, this post was meant more in the way of asking questions. In particular, I am not criticizing nor defending actual UK policy. I just want to know which textbook macro model (the model proposed by Krugman as all we need to know about macro) is consistent with DeLong's austerity story. Someone please do tell. 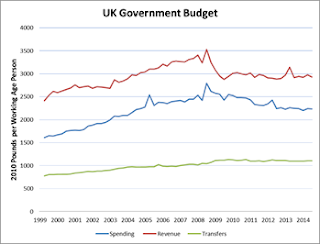 I asked my RA Michael Varley to provide some UK data on government spending, transfers and tax revenue. The data is plotted as a ratio of the working age population.